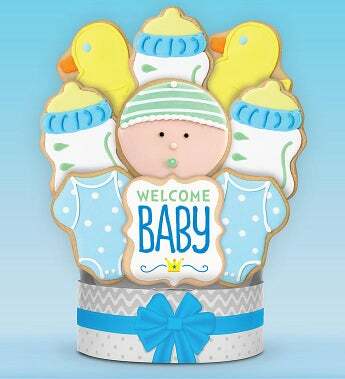 Welcome baby boy and delight his parents too with this delicious baby blue cookie arrangement. These unique buttery shortbread cookies are hand decorated with candy-like royal icing, and individually wrapped with care. Proud parents and older siblings will really appreciate this special treat honoring their new bundle of joy. 6 piece cookie arrangement - 15 oz. 9 piece cookie arrangement - 22.5 oz.